Not to be confused with Medicare (Australia), Medicare (Canada), or Medicaid. Medicare is a national health insurance program in the United States, begun in 1966 under the Social Security Administration (SSA) and now administered by the Centers for Medicare and Medicaid Services (CMS). It provides health insurance for Americans aged 65 and older, younger people with some disability status as determined by the Social Security Administration, as well as people with end stage renal disease and amyotrophic lateral sclerosis (ALS or Lou Gehrig's disease). Medicare is funded by a combination of a payroll tax, beneficiary premiums and surtaxes from beneficiaries, and general U.S. Treasury revenue. In 2017, Medicare provided health insurance for over 58 million individuals—more than 49 million people aged 65 and older and about 9 million younger people. On average, Medicare covers about half of healthcare expenses of those enrolled. According to annual Medicare Trustees reports and research by the government's MedPAC group, the enrollees then almost always cover their remaining costs either with additional insurance, or by joining a Medicare health plan. Almost no one uses United States Medicare only. No matter which of those two options the beneficiaries choose or if they choose to do nothing extra (around 1% according to annual Medicare Trustees reports), beneficiaries also have out of pocket (OOP) costs. OOP costs can include deductibles and co-pays; the costs of uncovered services—such as for long-term custodial, dental, hearing, and vision care; the cost of annual physical exams for those not on health plans; and the costs related to basic Medicare's lifetime and per-incident limits. Medicare is divided into four Parts. Medicare Part A covers hospital (inpatient, formally admitted only), skilled nursing (only after being formally admitted to a hospital for three days and not for custodial care), and hospice services. Part B covers outpatient services including some providers' services while inpatient at a hospital, outpatient hospital charges, most provider office visits even if the office is "in a hospital," and most professionally administered prescription drugs. Part D covers mostly self-administered prescription drugs. Part C is an alternative called Managed Medicare by the Trustees that allows patients to choose health plans with at least the same service coverage as Parts A and B (and most often more), often the benefits of Part D, and always an annual OOP spend limit which A and B lack. The beneficiary must enroll in Parts A and B first before signing up for Part C.
The name "Medicare" was originally given to a program providing medical care for families of people serving in the military as part of the Dependents' Medical Care Act, which was passed in 1956. President Dwight D. Eisenhower held the first White House Conference on Aging in January 1961, in which creating a health care program for social security beneficiaries was proposed. In July 1965, under the leadership of President Lyndon Johnson, Congress enacted Medicare under Title XVIII of the Social Security Act to provide health insurance to people age 65 and older, regardless of income or medical history. Johnson signed the bill into law on July 30, 1965 at the Harry S. Truman Presidential Library in Independence, Missouri. Former President Harry S. Truman and his wife, former First Lady Bess Truman became the first recipients of the program. Before Medicare was created, approximately 60% of people over the age of 65 had health insurance, with coverage often unavailable or unaffordable to many others, as older adults paid more than three times as much for health insurance as younger people. Many of this latter group (about 20% of the total in 2015) became "dual eligible" for both Medicare and Medicaid with passing the law. In 1966, Medicare spurred the racial integration of thousands of waiting rooms, hospital floors, and physician practices by making payments to health care providers conditional on desegregation. Medicare has been operated for a half century and, during that time, has undergone several changes. Since 1965, the program's provisions have expanded to include benefits for speech, physical, and chiropractic therapy in 1972. Medicare added the option of payments to health maintenance organizations (HMO) in the 1970s. As the years progressed, Congress expanded Medicare eligibility to younger people with permanent disabilities and receive Social Security Disability Insurance (SSDI) payments and to those with end-stage renal disease (ESRD). The association with HMOs begun in the 1970s was formalized under President Bill Clinton in 1997 as Medicare Part C (although not all Part C health plans sponsors have to be HMOs, about 75% are). In 2003, under President George W. Bush, a Medicare program for covering almost all self-administered prescription drugs was passed (and went into effect in 2006) as Medicare Part D (previously and still, professionally administered drugs such as chemotherapy but even the annual flu shot—which was first covered under President George H. W. Bush—are covered under Part B). Since the Medicare program began, the CMS (that was not always the name of the responsible bureaucracy) has contracted with private insurance companies to operate as intermediaries between the government and medical providers to administer Part A and Part B benefits. Contracted processes include claims and payment processing, call center services, clinician enrollment, and fraud investigation. Beginning in 1997 and 2005, respectively, these Part A and B administrators (whose contracts are bid out periodically), along with other insurance companies and other companies or organizations (such as integrated health delivery systems, unions and pharmacies), also began administering Part C and Part D plans. The Specialty Society Relative Value Scale Update Committee (or Relative Value Update Committee; RUC), composed of physicians associated with the American Medical Association, advises the government about pay standards for Medicare patient procedures performed by doctors and other professionals under Medicare Part B. A similar but different CMS process determines the rates paid for acute care and other hospitals—including skilled nursing facilities—under Medicare Part A. The rates paid for both Part A and Part B type services under Part C are whatever is agreed upon between the sponsor and the provider. The amounts paid for mostly self administered drugs under Part D is whatever is agreed up between the sponsor (almost always through a pharmacy benefit manager also used in commercial insurance) and pharmaceutical distributors and/or manufacturers. The expenditures from the trust funds under Parts A and B are fee for service whereas the expenditures from the trust funds under Parts C and D are capitated. In particular, it is important to understand that Medicare itself does not purchase either self administered or professionally administered drugs. In Part D, the Part D Trust Fund helps beneficiaries purchase drug insurance. For Part B drugs, the trust funds reimburses the professional that administers the drugs and allows a mark up for that service. Part A's inpatient admitted hospital and skilled nursing coverage is largely funded by revenue from a 2.9% payroll tax levied on employers and workers (each pay 1.45%). Until December 31, 1993, the law provided a maximum amount of compensation on which the Medicare tax could be imposed annually, in the same way that the Social Security payroll tax works in the U.S. Beginning on January 1, 1994, the compensation limit was removed. Self-employed individuals must pay the entire 2.9% tax on self-employed net earnings (because they are both employee and employer), but they may deduct half of the tax from the income in calculating income tax. Beginning in 2013, the rate of Part A tax on earned income exceeding US$200,000 for individuals (US$250,000 for married couples filing jointly) rose to 3.8%, in order to pay part of the cost of the subsidies mandated by the Affordable Care Act. Parts B and D are partially funded by premiums paid by Medicare enrollees and general U.S. Treasury revenue (to which Medicare beneficiaries contributed and may still contribute of course). In 2006, a surtax was added to Part B premium for higher-income seniors to partially fund Part D. In the Affordable Care Act's legislation of 2010, another surtax was then added to Part D premium for higher-income seniors to partially fund the Affordable Care Act and the number of Part B beneficiaries subject to the 2006 surtax was doubled, also partially to fund PPACA. Parts A and B/D use separate trust funds to receive and disburse the funds mentioned above. The Medicare Part C program uses these same two trust funds as well in a proportion determined by the CMS reflecting that Part C beneficiaries are fully on Parts A and B of Medicare just as all other beneficiaries, but that their medical needs are paid for per capita through a sponsor (most often an integrated health delivery system or spin out) to providers rather than "fee for service" (FFS) directly to a provider through an insurance company called a Medicare Administrative Contractor. In 2017, Medicare spending was over $700 billion and accounted for about 3.7% of U.S. gross domestic product and over 15% of total US federal spending. Because of the two Trust funds and their differing revenue sources (one dedicated and one not), the Trustees analyze Medicare spending as a percent of GDP rather than versus the Federal budget. Retirement of the Baby Boom generation is projected by 2030 to increase enrollment to more than 80 million. In addition the facts that the number of workers per enrollee will decline from 3.7 to 2.4 and that overall health care costs in the nation are rising pose substantial financial challenges to the program. Medicare spending is projected to increase from $700 billion in 2017 to just over $1.2 trillion by 2026, or from 3.7% of GDP to 4.7%. Baby-boomers are projected to have longer life spans, which will add to the future Medicare spending. In response to these financial challenges, Congress made substantial cuts to future payouts to providers (primarily acute care hospitals and skilled nursing facilities) as part of PPACA in 2010 and the Medicare Access and CHIP Reauthorization Act of 2015 (MACRA) and policymakers have offered many additional competing proposals to reduce Medicare costs further. People with disabilities who receive SSDI are eligible for Medicare while they continue to receive SSDI payments; they lose eligibility for Medicare based on disability if they stop receiving SSDI. The coverage does not begin until 24 month after the SSDI start date. The 24-month exclusion means that people who become disabled must wait two years before receiving government medical insurance, unless they have one of the listed diseases. The 24-month period is measured from the date that an individual is determined to be eligible for SSDI payments, not necessarily when the first payment is actually received. Many new SSDI recipients receive "back" disability pay, covering a period that usually begins six months from the start of disability and ending with the first monthly SSDI payment. A sample of the Medicare card format used through 2018. The ID number is the subscriber's Social Security number, followed by a suffix indicating the holder's relationship to the subscriber (generally "A" for self). There are separate lines for basic Part A and Part B's supplementary medical coverage, each with its own start date. A sample of the new Medicare cards mailed out in 2018 and 2019 depending on state of residence on a Social Security database. The new ID number is randomly generated and not tied to any personally identifying information. Beneficiaries on Mediare Part C health plans are issued with a separate card and ID number, in addition to their Original Medicare card. Medicare has four parts: loosely speaking Part A is Hospital Insurance. Part B is Medical Services Insurance. Medicare Part D covers many prescription drugs, though some are covered by Part B. In general, the distinction is based on whether or not the drugs are self-administered but even this distinction is not total. Public Part C Medicare health plans, the most popular of which are branded Medicare Advantage, are another way for Original Medicare (Part A and B) beneficiaries to receive their Part A, B and D benefits; simply, Part C is capitated fee and Original Medicare is fee for service. All Medicare benefits are subject to medical necessity. The original program included Parts A and B. Part-C-like plans have existed as demonstration projects in Medicare since the early 1970s, but the Part was formalized by 1997 legislation. Part D was enacted by 2003 legislation and introduced January 1, 2006. Previously coverage for self administered prescription drugs, if desired, was obtained by private insurance or through a public Part C plan (or by one of its predecessor demonstration plans before enactment). In April 2018, CMS began mailing out new Medicare cards with new ID numbers to all beneficiaries. Previous cards had ID numbers containing beneficiaries' Social Security numbers; the new ID numbers are randomly generated and not tied to any other personally identifying information. Part A covers inpatient hospital stays where the beneficiary has been formally admitted to the hospital, including semi-private room, food, and tests. As of January 1, 2018, Medicare Part A has an inpatient hospital deductible of $1340, coinsurance per day as $335 after 61 days confinement within one "spell of illness", coinsurance for "lifetime reserve days" (essentially, days 91-150 of one or more stay of more than 60 days) of $670 per day. The structure of coinsurance in a Skilled Nursing Facility (following a medically necessary hospital confinement of 3 nights in row or more) is different: zero for days 1-20; $167.50 per day for days 21-100. Many medical services provided under Part A (e.g., some surgery in an acute care hospital, some physical therapy in a skilled nursing facility) is covered under Part B. These coverage amounts increase or decrease yearly on 1st day of the year. The maximum length of stay that Medicare Part A covers in a hospital admitted inpatient stay or series of stays is typically 90 days. The first 60 days would be paid by Medicare in full, except one copay (also and more commonly referred to as a "deductible") at the beginning of the 60 days of $1340 as of 2018. Days 61–90 require a co-payment of $335 per day as of 2018. The beneficiary is also allocated "lifetime reserve days" that can be used after 90 days. These lifetime reserve days require a copayment of $670 per day as of 2018, and the beneficiary can only use a total of 60 of these days throughout their lifetime. A new pool of 90 hospital days, with new copays of $1340 in 2018 and $335 per day for days 61–90, starts only after the beneficiary has 60 days continuously with no payment from Medicare for hospital or Skilled Nursing Facility confinement. Some "hospital services" are provided as inpatient services, which would be reimbursed under Part A; or as outpatient services, which would be reimbursed, not under Part A, but under Part B instead. The "Two-Midnight Rule" decides which is which. In August 2013, the Centers for Medicare and Medicaid Services announced a final rule concerning eligibility for hospital inpatient services effective October 1, 2013. Under the new rule, if a physician admits a Medicare beneficiary as an inpatient with an expectation that the patient will require hospital care that "crosses two midnights," Medicare Part A payment is "generally appropriate." However, if it is anticipated that the patient will require hospital care for less than two midnights, Medicare Part A payment is generally not appropriate; payment such as is approved will be paid under Part B. The time a patient spends in the hospital before an inpatient admission is formally ordered is considered outpatient time. But, hospitals and physicians can take into consideration the pre-inpatient admission time when determining if a patient's care will reasonably be expected to cross two midnights to be covered under Part A. In addition to deciding which trust fund is used to pay for these various outpatient vs. inpatient charges, the number of days for which a person is formally considered an admitted patient affects eligibility for Part A skilled nursing services. If the patient is not receiving rehabilitation but has some other ailment that requires skilled nursing supervision (e.g., wound management) then the nursing home stay would be covered. The care being rendered by the nursing home must be skilled. Medicare part A does not pay for stays that only provide custodial, non-skilled, or long-term care activities, including activities of daily living (ADL) such as personal hygiene, cooking, cleaning, etc. The first 20 days would be paid for in full by Medicare with the remaining 80 days requiring a co-payment of $167.50 per day as of 2018. Many insurance group retiree, Medigap and Part C insurance plans have a provision for additional coverage of skilled nursing care in the indemnity insurance policies they sell or health plans they sponsor. If a beneficiary uses some portion of their Part A benefit and then goes at least 60 days without receiving facility-based skilled services, the 90-day hospital clock and 100-day nursing home clock are reset and the person qualifies for new benefit periods. Part B medical insurance helps pay for some services and products not covered by Part A, generally on an outpatient basis (but also when on an unadmitted observation status in a hospital). Part B is optional. It is often deferred if the beneficiary or his/her spouse is still working and has group health coverage through that employer. There is a lifetime penalty (10% per year on the premium) imposed for not enrolling in Part B when first eligible. Part B coverage includes outpatient physician services, visiting nurse, and other services such as x-rays, laboratory and diagnostic tests, influenza and pneumonia vaccinations, blood transfusions, renal dialysis, outpatient hospital procedures, limited ambulance transportation, immunosuppressive drugs for organ transplant recipients, chemotherapy, hormonal treatments such as Lupron, and other outpatient medical treatments administered in a doctor's office. It also includes chiropractic care. Medication administration is covered under Part B if it is administered by the physician during an office visit. Part B also helps with durable medical equipment (DME), including but not limited to canes, walkers, lift chairs, wheelchairs, and mobility scooters for those with mobility impairments. Prosthetic devices such as artificial limbs and breast prosthesis following mastectomy, as well as one pair of eyeglasses following cataract surgery, and oxygen for home use are also covered. Complex rules control Part B benefits, and periodically issued advisories describe coverage criteria. On the national level these advisories are issued by CMS, and are known as National Coverage Determinations (NCD). Local Coverage Determinations (LCD) apply within the multi-state area managed by a specific regional Medicare Part B contractor (which is an insurance company), and Local Medical Review Policies (LMRP) were superseded by LCDs in 2003. Coverage information is also located in the CMS Internet-Only Manuals (IOM), the Code of Federal Regulations (CFR), the Social Security Act, and the Federal Register. The Monthly Premium for Part B for 2019 is $135.50 per month but anyone on Social Security in 2019 is "held harmless" from that amount if the increase in their SS monthly benefit does not cover the increase in their Part B premium from 2018 to 2019. This hold harmless provision is significant in years when SS does not increase but that is not the case for 2019. There are additional income-weighted surtaxes for those with incomes more than $85,000 per annum. With the passage of the Balanced Budget Act of 1997, Medicare beneficiaries were formally given the option to receive their Original Medicare benefits through capitated health insurance Part C health plans, instead of through the Original fee for service Medicare payment system. Many had previously had that option via a series of demonstration projects that dated back to the early 1970s. These Part C plans were initially known in 1997 as "Medicare+Choice". As of the Medicare Modernization Act of 2003, most "Medicare+Choice" plans were re-branded as "Medicare Advantage" (MA) plans (though MA is a government term and might not even be "visible" to the Part C health plan beneficiary). Other plan types, such as 1876 Cost plans, are also available in limited areas of the country. Cost plans are not Medicare Advantage plans and are not capitated. Instead, beneficiaries keep their Original Medicare benefits while their sponsor administers their Part A and Part B benefits. The sponsor of a Part C plan could be an integrated health delivery system or spin-out, a union, a religious organization, an insurance company or other type of organization. Public Part C Medicare Advantage and other Part C health plans are required to offer coverage that meets or exceeds the standards set by Original Medicare but they do not have to cover every benefit in the same way (the plan must be actuarially equivalent to Original Medicare benefits). After approval by the Centers for Medicare and Medicaid Services, if a Part C plan chooses to cover less than Original Medicare for some benefits, such as Skilled Nursing Facility care, the savings may be passed along to consumers by offering even lower co-payments for doctor visits (or any other plus or minus aggregation approved by CMS). Original "fee-for-service" Medicare Parts A and B have a standard benefit package that covers medically necessary care as described in the sections above that members can receive from nearly any hospital or doctor in the country (if that doctor or hospital accepts Medicare). Original Medicare beneficiaries who choose to enroll in a Part C Medicare Advantage or other Part C health plan instead give up none of their rights as an Original Medicare beneficiary, receive the same standard benefits—as a minimum—as provided in Original Medicare, and get an annual out of pocket (OOP) upper spending limit not included in Original Medicare. However they must typically use only a select network of providers except in emergencies or for urgent care while travelling, typically restricted to the area surrounding their legal residence (which can vary from tens to over 100 miles depending on county). Most Part C plans are traditional health maintenance organizations (HMOs) that require the patient to have a primary care physician, though others are preferred provider organizations (which typically means the provider restrictions are not as confining as with an HMO). Others are hybrids of HMO and PPO called HMO-POS (for point of service) and a few public Part C health plans are actually fee for service hybrids. Public Part C Medicare Advantage health plan members typically also pay a monthly premium in addition to the Medicare Part B premium to cover items not covered by traditional Medicare (Parts A & B), such as the OOP limit, self-administered prescription drugs, dental care, vision care, annual physicals, coverage outside the United States, and even gym or health club memberships as well as—and probably most importantly—reduce the 20% co-pays and high deductibles associated with Original Medicare. But in some situations the benefits are more limited (but they can never be more limited than Original Medicare and must always include an OOP limit) and there is no premium. The OOP limit can be as low as $1500 and as high as but no higher than $6700. In some cases, the sponsor even rebates part or all of the Part B premium, though these types of Part C plans are becoming rare. Before 2003 Part C plans tended to be suburban HMOs tied to major nearby teaching hospitals that cost the government the same as or even 5% less on average than it cost to cover the medical needs of a comparable beneficiary on Original Medicare. The 2003-law payment framework/bidding/rebate formulas overcompensated some Part C plan sponsors by 7 percent (2009) on average nationally compared to what Original Medicare beneficiaries cost per person on average nationally that year and as much as 5 percent (2016) less nationally in other years (see any recent year's Medicare Trustees Report, Table II.B.1). The 2003 payment formulas succeeded in increasing the percentage of rural and inner city poor that could take advantage of the OOP limit and lower co-pays and deductibles—as well as the coordinated medical care—associated with Part C plans. In practice however, one set of Medicare beneficiaries received more benefits than others. The MedPAC Congressional advisory group found in one year the comparative difference for "like beneficiaries" was as high as 14% and have tended to average about 2% higher. The word "like" in the previous sentence is key. MedPAC does not include all beneficiaries in its comparisons and MedPAC will not define what it means by "like" but it apparently includes people who are only on Part A, which severely skews its percentage comparisons—see January 2017 MedPAC meeting presentations. The differences caused by the 2003-law payment formulas were almost completely eliminated by PPACA and have been almost totally phased out according to the 2018 MedPAC annual report, March 2018. One remaining special-payment-formula program—designed primarily for unions wishing to sponsor a Part C plan—is being phased out beginning in 2017. In 2013 and since, on average a Part C beneficiary cost the Medicare Trust Funds 2%-5% less than a beneficiary on traditional fee for service Medicare, completely reversing the situation in 2006-2009 right after implementation of the 2003 law and restoring the capitated fee vs fee for service funding balance to its original intended parity level. The intention of both the 1997 and 2003 law was that the differences between fee for service and capitated fee beneficiaries would reach parity over time and that has mostly been achieved, given that it can never literally be achieved without a major reform of Medicare because the Part C capitated fee in one year is based on the fee for service spending the previous year. Enrollment in public Part C health plans, including Medicare Advantage plans, grew from about 1% of total Medicare enrollment in 1997 when the law was passed (the 1% representing people on pre-law demonstration programs) to about 35% in 2018. Of course the absolute number of beneficiaries on Part C has increased even more dramatically on a percentage basis because of the large increase of people on Original Medicare since 1997. Almost all Medicare beneficiaries have access to at least two public Medicare Part C plans; most have access to three or more. Medicare Part D went into effect on January 1, 2006. Anyone with Part A or B is eligible for Part D, which covers mostly self-administered drugs. It was made possible by the passage of the Medicare Modernization Act of 2003. To receive this benefit, a person with Medicare must enroll in a stand-alone Prescription Drug Plan (PDP) or public Part C healh plan with integrated prescription drug coverage (MA-PD). These plans are approved and regulated by the Medicare program, but are actually designed and administered by various sponsors including charities, integrated health delivery systems, unions and health insurance companies; almost all these sponsors in turn use pharmacy benefit managers in the same way as they are used by sponsors of health insurance for those not on Medicare. Unlike Original Medicare (Part A and B), Part D coverage is not standardized (though it is highly regulated by the Centers for Medicare and Medicaid Services). Plans choose which drugs they wish to cover (but must cover at least two drugs in 148 different categories and cover all or "substantially all" drugs in the following protected classes of drugs: anti-cancer; anti-psychotic; anti-convulsant, anti-depressants, immuno-suppressant, and HIV and AIDS drugs). The plans can also specify with CMS approval at what level (or tier) they wish to cover it, and are encouraged to use step therapy. Some drugs are excluded from coverage altogether and Part D plans that cover excluded drugs are not allowed to pass those costs on to Medicare, and plans are required to repay CMS if they are found to have billed Medicare in these cases. Coverage by beneficiary spending is broken up into four phases: deductible, initial spend, gap (infamously called the "donut hole"), and catastrophic. Under a CMS template, there is usually a $100 or so deductible before benefits commence (maximum of $415 in 2019) followed by the initial spend phase where the templated co-pay is 25%, followed by gap phase (where originally the templated co-pay was 100% but that will fall to 25% in 2020 for all drugs), followed by the catastrophic phase with a templated co-pay of about 5%. The beneficiaries' OOP spend amounts vary yearly but are approximately as of 2018 $1000 in the initial spend phase and $3000 to reach the catastrophic phase. This is just a template and about half of all Part D plans differ (for example, no initial deductible, better coverage in the gap) with permission of CMS, which it typically grants as long as the sponsor provides at least the actuarial equivalent value. Most Medicare Part B enrollees pay an insurance premium for this coverage; the standard Part B premium for 2019 is $135.50 a month. A new income-based premium surtax schema has been in effect since 2007, wherein Part B premiums are higher for beneficiaries with incomes exceeding $85,000 for individuals or $170,000 for married couples. Depending on the extent to which beneficiary earnings exceed the base income, these higher Part B premiums are from 30% to 70% higher with the highest premium paid by individuals earning more than $214,000, or married couples earning more than $428,000. Medicare Part B premiums are commonly deducted automatically from beneficiaries' monthly Social Security checks. They can also be paid quarterly via bill sent directly to beneficiaries. This alternative is becoming more common because whereas the eligibility age for Medicare has remained at 65 per the 1965 legislation, the so-called Full Retirement Age for Social Security has been increased to 66 and will go even higher over time. Therefore, many people delay collecting Social Security but join Medicare at 65 and have to pay their Part B premium directly. Of the Medicare beneficiaries who are not dual eligible for both Medicare (around 10% are fully dual eligible) and Medicaid or that do not receive group retirement insurance via a former employer (about 30%) or do not choose a public Part C Medicare health plan (about 35%) or who are not otherwise insured (about 5% -- e.g., still working and receiving employer insurance, on VA, etc. ), almost all the remaining elect to purchase a type of private supplemental indemnity insurance policy called a Medigap plan (about 20%), to help fill in the financial holes in Original Medicare (Part A and B) in addition to public Part D. Note that the percentages add up to over 100% because many beneficiaries have more than one type of additional protection on top of Original Medicare. These Medigap insurance policies are standardized by CMS, but are sold and administered by private companies. Some Medigap policies sold before 2006 may include coverage for prescription drugs. Medigap policies sold after the introduction of Medicare Part D on January 1, 2006 are prohibited from covering drugs. Medicare regulations prohibit a Medicare beneficiary from being sold both a public Part C Medicare health plan and a private Medigap Policy. As with public Part C health plans, private Medigap policies are only available to beneficiaries who are already signed up for Original Medicare Part A and Part B. These policies are regulated by state insurance departments rather than the federal government although CMS outlines what the various Medigap plans must cover at a minimum. Therefore, the types and prices of Medigap policies vary widely from state to state and the degree of underwriting, discounts for new members, open enrollment and guaranteed issue also varies widely from state to state. As of 2016, 11 policies are currently sold—though few are available in all states, and some are not available at all in Massachusetts, Minnesota and Wisconsin. These plans are standardized with a base and a series of riders. These are Plan A, Plan B, Plan C, Plan D, Plan F, High Deductible Plan F, Plan G, Plan K, Plan L, Plan M, and Plan N. Cost is usually the only difference between Medigap policies with the same letter sold by different insurance companies in the same state. Unlike public Part C Medicare health Plans, Medigap plans have no networks, and any provider who accepts Original Medicare must also accept Medigap. All insurance companies that sell Medigap policies are required to make Plan A available, and if they offer any other policies, they must also make either Plan C or Plan F available as well, though Plan F is scheduled to sunset in the year 2020. Anyone who currently has a Plan F may keep it. Many of the insurance companies that offer Medigap insurance policies also sponsor Part C health plans but most Part C health plans are sponsored by integrated health delivery systems and their spin-offs, charities, and unions as opposed to insurance companies. The leading sponsor of both public Part C heatlh plans and private Medigap plans is AARP. There are two ways for providers to be reimbursed in Medicare. "Participating" providers accept "assignment," which means that they accept Medicare's approved rate for their services as payment (typically 80% from Medicare and 20% from the beneficiary). Some non participating doctors do not take assignment, but they also treat Medicare enrollees and are authorized to balance bill no more than a small fixed amount above Medicare's approved rate. A minority of doctors are "private contractors" from a Medicare perspective, which means they opt out of Medicare and refuse to accept Medicare payments altogether. These doctors are required to inform patients that they will be liable for the full cost of their services out-of-pocket, often in advance of treatment. Generally, if you already receive Social Security payments, at age 65 you are automatically enrolled in Medicare Part A (Hospital Insurance) and Medicare Part B (Medical Insurance). If you choose not to accept Part B (typically because you are still working and receiving employer insurance), you must proactively opt out of it when you receive your automatic enrollment package. You may delay Part B enrollment with no penalty under some circumstances (e.g. the employment situation noted above), or with penalty under other circumstances. If you do not receive SS when you turn 65 you must proactively join Medicare if you want it (and the penalties may apply if you choose not to based on various factors). Medicare differs from private insurance available to working Americans in that it is a social insurance program. Social insurance programs provide statutorily guaranteed benefits to the entire population (under certain circumstances, such as old age or unemployment). These benefits are financed in significant part through universal taxes. In effect, Medicare is a mechanism by which the state takes a portion of its citizens' resources to provide health and financial security to its citizens in old age or in case of disability, helping them cope with the enormous, unpredictable cost of health care. In its universality, Medicare differs substantially from private insurers, which must decide whom to cover and what benefits to offer to manage their risk pools and ensure that their costs don't exceed premiums. The Medicare Trustees reduced their forecast for Medicare costs as % GDP, mainly due to a lower rate of healthcare cost increases. Over the long-term, Medicare faces significant financial challenges because of rising overall health care costs, increasing enrollment as the population ages, and a decreasing ratio of workers to enrollees. Total Medicare spending is projected to increase from $523 billion in 2010 to around $900 billion by 2020. From 2010 to 2030, Medicare enrollment is projected to increase dramatically, from 47 million to 79 million, and the ratio of workers to enrollees is expected to decrease from 3.7 to 2.4. However, the ratio of workers to retirees has declined steadily for decades, and social insurance systems have remained sustainable due to rising worker productivity. There is some evidence that productivity gains will continue to offset demographic trends in the near future. 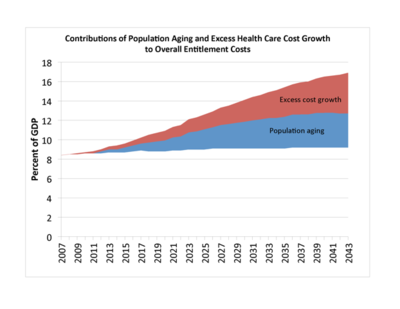 This measure, which examines Medicare spending in the context of the US economy as a whole, is projected to increase from 3.7 percent in 2017 to 6.2 percent by 2092 under current law and over 9 percent under what the actuaries really expect will happen (called an "illustrative example" in recent-year Trustees Reports). This measure involves only Part A. The trust fund is considered insolvent when available revenue plus any existing balances will not cover 100 percent of annual projected costs. According to the latest estimate by the Medicare trustees (2018), the trust fund is expected to become insolvent in 8 years (2026), at which time available revenue will cover around 85 percent of annual projected costs for Part A services. Since Medicare began, this solvency projection has ranged from two to 28 years, with an average of 11.3 years. This and other projections in Medicare Trustees reports are based on what its actuaries call intermediate scenario but the reports also include worst-case and best case scenarios that are quite different (other scenarios presume Congress will change present law). Per capita spending relative to inflation per-capita GDP growth was to be an important factor used by the PPACA-specified Independent Payment Advisory Board (IPAB), as a measure to determine whether it must recommend to Congress proposals to reduce Medicare costs. However the IPAB never formed and was formerly repealed by the Balanced Budget Act of 2018. Additionally, the PPACA created the Independent Payment Advisory Board ("IPAB"), which was empowered to submit legislative proposals to reduce the cost of Medicare if the program's per-capita spending grows faster than per-capita GDP plus one percent. The IPAB was never formed and was formally repealed by the Balanced Budget Act of 2018. The PPACA also made some changes to Medicare enrollee's' benefits. By 2020, it will "close" the so-called "donut hole" between Part D plans' initial spend phase coverage limits and the catastrophic cap on out-of-pocket spending, reducing a Part D enrollee's' exposure to the cost of prescription drugs by an average of $2,000 a year. That is, the template co-pay in the gap (which legally still exists) will be the same as the template co-pay in the initial spend phase, 25%. This lowered costs for about 5% of the people on Medicare. Limits were also placed on out-of-pocket costs for in-network care for public Part C health plan enrollees. Most of these plans had such a limit but ACA formalized the annual out of pocket spend limit. Beneficiaries on traditional Medicare do not get such a limit but can effectively arrange for one through private insurance. Since the mid-1990s, there have been a number of proposals to change Medicare from a publicly run social insurance program with a defined benefit, for which there is no limit to the government's expenses, into a publicly run health plan program that offers "premium support" for enrollees. The basic concept behind the proposals is that the government would make a defined contribution, that is a premium support, to the health plan of a Medicare enrollee's choice. Sponsors would compete to provide Medicare benefits and this competition would set the level of fixed contribution. Additionally, enrollees would be able to purchase greater coverage by paying more in addition to the fixed government contribution. Conversely, enrollees could choose lower cost coverage and keep the difference between their coverage costs and the fixed government contribution. The goal of premium Medicare plans is for greater cost-effectiveness; if such a proposal worked as planned, the financial incentive would be greatest for Medicare plans that offer the best care at the lowest cost. This concept is basically how public Medicare Part C already works (but with a much more complicated competitive bidding process that drives up costs for the Trustees, but is very advantageous to the beneficiaries). Given that only about 1% of people on Medicare got premium support when Aaron and Reischauer first wrote their proposal in 1995 and the percentage is now 35% on the way to 50% by 2040 according to the Trustees, perhaps no further reform is needed. There have been a number of criticisms of the premium support model. Some have raised concern about risk selection, where insurers find ways to avoid covering people expected to have high health care costs. Premium support proposals, such as the 2011 plan proposed by Senator Ron Wyden and Rep. Paul Ryan (R–Wis. ), have aimed to avoid risk selection by including protection language mandating that plans participating in such coverage must provide insurance to all beneficiaries and are not able to avoid covering higher risk beneficiaries. Some critics are concerned that the Medicare population, which has particularly high rates of cognitive impairment and dementia, would have a hard time choosing between competing health plans. Robert Moffit, a senior fellow of The Heritage Foundation responded to this concern, stating that while there may be research indicating that individuals have difficulty making the correct choice of health care plan, there is no evidence to show that government officials can make better choices. Henry Aaron, one of the original proponents of premium supports, has recently argued that the idea should not be implemented, given that Medicare Advantage plans have not successfully contained costs more effectively than traditional Medicare and because the political climate is hostile to the kinds of regulations that would be needed to make the idea workable. Currently public Part C Medicare health plans avoid this issue with an indexed risk forumula that provides lower per capita payments to sponsors for relatively (remember all these people are over 65) healthy plan members and higher per capita payments for less healthy members. Currently, people with Medicare can get prescription drug coverage through a public Medicare Part C plan or through the standalone Part D prescription drug plans (PDPs) program. Each plan sponsor establishes its own coverage policies and could if desired independently negotiate the prices it pays to drug manufacturers. But because each plan has a much smaller coverage pool than the entire Medicare program, many argue that this system of paying for prescription drugs undermines the government's bargaining power and artificially raises the cost of drug coverage. Conversely, negotiating for the sponsors is almost always done by one of three or four companies typically tied to pharmacy retailers each of whom alone has much more buying power than the entire Medicare program. That pharmacy-centric vs. government-centric approach appears to have worked given that Part D has come in at 50% or more under original projected spending and has held average annual drug spending by seniors in absolute dollars fairly constant for over 10 years. There are other proposals for savings on prescription drugs that do not require such fundamental changes to Medicare Part D's payment and coverage policies. Manufacturers who supply drugs to Medicaid are required to offer a 15 percent rebate on the average manufacturer's price. Low-income elderly individuals who qualify for both Medicare and Medicaid receive drug coverage through Medicare Part D, and no reimbursement is paid for the drugs the government purchases for them. Reinstating that rebate would yield savings of $112 billion, according to a recent CBO estimate. Some have questioned the ability of the federal government to achieve greater savings than the largest PDPs, since some of the larger plans have coverage pools comparable to Medicare's, though the evidence from the VHA is promising. Some also worry that controlling the prices of prescription drugs would reduce incentives for manufacturers to invest in R&D, though the same could be said of anything that would reduce costs. However the comparisons with the VHA point out that the VA only covers about half the drugs as Part D.
^ Robinson, P. I. (1957). Medicare : Uniformed Services Program for Dependents. Social Security Bulletin, 20(7), 9–16. ^ Mcnamara PAT, Dirksen EM, Church F, Muskie ES. The 1961 White House Conference on Aging : basic policy statements and recommendations / prepared for the Special Committee on Aging, United States Senate 87th Congress, 1st Session, Committee Print, May 15, 1961. ^ Folliard, Edward T. (July 31, 1965). "Medicare Bill Signed By Johnson: 33 Congressmen Attend Ceremony In Truman Library". The Washington Post. p. A1. ^ Pearson, Drew (July 29, 1965). "What Medicare Means to Taxpayers: How to Get Voluntary Insurance". The Washington Post. p. C13. ^ See Health Insurance for the Aged Act, Title I of the Social Security Amendments of 1965, Pub. L. No. 89-97, 79 Stat. 286 (July 30, 1965), generally effective beginning with the month of July 1966. Section 321 of the Act amended section 1401 of the Internal Revenue Code to impose the Medicare tax. ^ "Truman Library - July 30, 1965: President Lyndon B. Johnson Signs Medicare Bill". www.trumanlibrary.org. Retrieved April 2, 2017. ^ "About CMS". CMS.gov. Retrieved July 27, 2015. ^ Pear, Robert (May 31, 2015). "Federal Investigators Fault Medicare's Reliance on Doctors for Pay Standards". New York Times. Retrieved June 1, 2015. ^ "Self-Employment Tax (Social Security and Medicare Taxes)". IRS. ^ a b A Primer on Medicare Financing | The Henry J. Kaiser Family Foundation. Kff.org (January 31, 2011). Retrieved on July 17, 2013. ^ "Encumbered exchange". The Economist. ISSN 0013-0613. Retrieved September 16, 2016. ^ "CMS Quality Strategy, 2016" (PDF). Retrieved September 16, 2016. ^ a b "Medicare Numbers Suffixes and Prefixes". www.novitas-solutions.com. Retrieved December 5, 2018. ^ "New Medicare Card Mailing Strategy" (PDF). www.cms.gov. Centers for Medicare and Medicaid Services. Retrieved December 5, 2018. ^ New Medicare Card Project Frequently Asked Questions (FAQs) (PDF) (Report). Center for Medicare and Medicaid Services. May 2, 2018. ^ Bunis, Dena (June 27, 2018). "Still Haven't Received a New Medicare Card? Call the Hotline". AARP. Retrieved December 5, 2018. ^ "Medicare 2018 costs at a glance". Medicare. Retrieved April 26, 2018. ^ "Benefit period". Medicare. Retrieved April 26, 2018. ^ Hord, Emily M.; McBrayer; McGinnis; Leslie; Kirkland, PLLC (September 10, 2013). "Clarifying the "Two-Midnight Rule" and Part A Payments Re: Inpatient Care". The National Law Review. ^ Hord, Emily M. (September 12, 2013). "Clarifying the "Two-Midnight Rule" and Part A Payments, cont". The National Law Review. ^ "Readmissions Reduction Program, seen June 25, 2013". Cms.gov. Retrieved August 30, 2013. ^ "Kaiser health News, Medicare Revises Readmissions Penalties – Again". Kaiserhealthnews.org. March 14, 2013. Retrieved August 30, 2013. ^ Hines AL, Barrett ML, Jiang HJ, Steiner CA (April 2014). "Conditions With the Largest Number of Adult Hospital Readmissions by Payer, 2011". HCUP Statistical Brief #172. Rockville, MD: Agency for Healthcare Research and Quality. ^ "Knee and hip replacement readmissions may cost $265,000". EHR Intelligence. August 15, 2013. Retrieved August 24, 2013. ^ "Report to Congress, Medicare Payment Policy. March 2012, pp. 195–96" (PDF). MedPAC. Archived from the original (PDF) on October 19, 2013. Retrieved August 24, 2013. ^ "Five Years of Quality, p. 8" (PDF). Florida Hospital Association. Retrieved August 24, 2013. ^ Joynt, Karen E.; Jha, Ashish K. (2012). "Thirty-Day Readmissions – Truth and Consequences". New England Journal of Medicine. 366 (15): 1366–69. doi:10.1056/NEJMp1201598. PMID 22455752. ^ Joynt, KE; Jha, AK (2012). "Thirty-day readmissions--truth and consequences". The New England Journal of Medicine. 366 (15): 1366–9. doi:10.1056/NEJMp1201598. PMID 22455752. ^ "Summary of Costs and Benefits". Federalregister.gov. August 31, 2012. Retrieved August 30, 2013. ^ "Math Underlying the Penalties". Globe1234.com. July 18, 2013. Retrieved August 30, 2013. ^ Medicare Guide to Covered Products, Services and Information Archived February 9, 2014, at the Wayback Machine. Medicare.com. Retrieved on July 17, 2013. ^ "Medicare Hospice Benefits" (PDF). Medicare, the Official U.S. Government Site for People with Medicare. March 2000. Archived from the original (PDF) on March 6, 2009. Retrieved February 1, 2009. ^ Howard, Anna Schwamlein; Biddle, Drinker; LLP, Reath (November 5, 2013). "Dewonkify – Medicare Part B". The National Law Review. ^ Medicare: Part A & B, University of Iowa Hospitals and Clinics, 2005. ^ Pope, Christopher. "Supplemental Benefits Under Medicare Advantage". Health Affairs. Retrieved January 25, 2016. ^ "Report on the Medicare Drug Discount Card Program Sponsor McKesson Health Solutions, A-06-06-00022" (PDF). Retrieved February 19, 2011. ^ Yamamoto, Dale; Neuman, Tricia; Strollo, Michelle Kitchman (September 2008). How Does the Benefit Value of Medicare Compare to the Benefit Value of Typical Large Employer Plans? (PDF). Kaiser Family Foundation. ^ 2012 Medicare & You handbook, Centers for Medicare & Medicaid Services. ^ a b c d e "Medicare 2017 costs at a glance". Medicare, U.S. Centers for Medicare & Medicaid Services, Baltimore. 2017. Retrieved March 12, 2017. ^ Silverman E, Skinner J (2004). "Medicare upcoding and hospital ownership". Journal of Health Economics. 23 (2): 369–89. doi:10.1016/j.jhealeco.2003.09.007. PMID 15019762. ^ Lauren A. McCormick, Russel T. Burge. Diffusion of Medicare's RBRVS and related physician payment policies – resource-based relative value scale – Medicare Payment Systems: Moving Toward the Future Health Care Financing Review. Winter, 1994. ^ Uwe Reinhardt (December 10, 2010). "The Little-Known Decision-Makers for Medicare Physicians Fees". The New York Times. Retrieved July 6, 2011. ^ Medicare's Physician Payment Rates and the Sustainable Growth Rate. (PDF) CBO TESTIMONY Statement of Donald B. Marron, Acting Director. July 25, 2006. ^ "H.R. 4015". Congressional Budget Office. Retrieved March 11, 2014. ^ Viebeck, Elise (March 12, 2014). "Obama threatens to veto GOP 'doc fix' bill". The Hill. Retrieved March 13, 2014. ^ a b Kasperowicz, Pete (March 26, 2014). "House GOP readies year-long 'doc fix'". The Hill. Retrieved March 27, 2014. ^ Kasperowicz, Pete (March 27, 2014). "House approves 'doc fix' in voice vote". The Hill. Retrieved March 27, 2014. ^ Kaiser Family Foundation 2010 Chartbook, "Figure 2.15"
^ Mayer, Caroline. "What To Do If Your Doctor Won't Take Medicare". forbes.com. ^ Laugesen, Miriam (May 10, 2012). "Study Finds that the AMA Committee Recommendations on Doctor Fees Are Followed Nine Times out of Ten". The National Law Review. Retrieved June 6, 2012. ^ "Medicare Incentive Payments in Health Professional Shortage Areas". ruralhealthinfo.org. Retrieved February 15, 2018. ^ "Overview HPSA/PSA (Physician Bonuses)". Cms.gov. Retrieved February 19, 2011. ^ Center or Medicare and Medicaid Services, "NHE Web Tables for Selected Calendar Years 1960–2010" Archived April 11, 2012, at the Wayback Machine, Table 16. ^ Center for Medicare and Medicaid Services, "National Health Expenditure Projections 2010–2020" Archived May 1, 2012, at the Wayback Machine, Table 17. ^ Karen Pollitz, et. Al ""Coverage When It Counts: What Does Health Insurance In Massachusetts Cover And How Can Consumers Know?"" The Robert Wood Johnson Foundation and Georgetown University. May 2009. ^ "Medicare Chartbook, 2010". Kaiser Family Foundation. October 30, 2010. Archived from the original on October 30, 2010. Retrieved October 20, 2013. ^ CBO | The Long-Term Budget Outlook and Options for Slowing the Growth of Health Care Costs. Cbo.gov (June 17, 2008). Retrieved on July 17, 2013. ^ U.S. Health Spending Projected To Grow 5.8 Percent Annually – Health Affairs Blog. Healthaffairs.org (July 28, 2011). Retrieved on July 17, 2013. ^ "Graph on Page 4" (PDF). Retrieved August 30, 2013. ^ "2016 ANNUAL REPORT OF THE BOARDS OF TRUSTEES OF THE FEDERAL HOSPITAL INSURANCE AND FEDERAL SUPPLEMENTARY MEDICAL INSURANCE TRUST FUNDS" (PDF). cms.gov. ^ "Medicare: People's Chief Concerns". Public Agenda. ^ "Paying for Quality over Quantity in Health Care". Public Agenda. ^ ""High-Risk Series: An Update" U.S. Government Accountability Office, January 2003 (PDF)" (PDF). Retrieved July 21, 2006. ^ Office, U. S. Government Accountability (October 12, 2005). "U.S. GAO – Report Abstract" (GAO-05–656). Gao.gov. Retrieved February 19, 2011. ^ Ball, Robert M. (Winter 1995). "Perspectives On Medicare: What Medicare's Architects Had In Mind". Health Affairs. 14 (4): 62–72. doi:10.1377/hlthaff.14.4.62. ^ Pope, Chris. "Medicare's Single-Payer Experience". National Affairs. Retrieved January 20, 2016. ^ Improvements Needed in Provider Communications and Contracting Procedures, Testimony Before the Subcommittee on Health, Committee on Ways and Means, House of Representatives, September 25, 2001. ^ Fuchs, Elissa (February 2009). "Overview: Medicare Direct Graduate and Indirect Medical Education Payments". AAMC Reporter. ISSN 1544-0540. ^ a b Croasdale, Myrle (January 30, 2006). "Innovative funding opens new residency slots". American Medical News. American Medical Association. ^ Rosenblatt, Roger A.; Andrilla, C. Holly A.; Curtin, Thomas; Hart, L. Gary (March 1, 2006). "Shortages of Medical Personnel at Community Health Centers". Journal of the American Medical Association. 295 (9): 1042–49. doi:10.1001/jama.295.9.1042. PMID 16507805. ^ Rovner, Julie (August 2012). "Prognosis Worsens For Shortages In Primary Care". Talk of the Nation. .  by NPR. ^ Dallek, Robert (Summer 2010). "Medicare's Complicated Birth". americanheritage.com. American Heritage. p. 28. Archived from the original on August 22, 2010. ^ a b Rice, Thomas; Desmond, Katherine; Gabel, Jon (Fall 1990). "The Medicare Catastrophic Coverage Act: a Post-mortem". Health Affairs. 9 (3): 75–87. doi:10.1377/hlthaff.9.3.75. ^ a b Hulse, Carl (November 17, 2013). "Lesson Is Seen in Failure of Law on Medicare in 1989". The New York Times. ^ Marcus, Aliza (July 9, 2008). "Senate Vote on Doctor Fees Carries Risks for McCain". Bloomberg News. ^ Pear, Robert (August 2, 2007). "House Passes Children's Health Plan 225–204". New York Times. ^ Selected CBO Publications Related to Health Care Legislation, 2009–2010 (PDF) (Report). Congressional Budget Office of the United States of America. December 2010. p. 20. ^ "How will the Affordable Care Act Change Medicare?". Ratehospitals.com. ^ "Shining a Light on Health Insurance Rate Increases – Centers for Medicare & Medicaid Services". Healthcare.gov. Retrieved July 17, 2013. ^ "Income-Relating Medicare Part B and Part D Premiums: How Many Medicare Beneficiaries Will Be Affected?" (PDF). Kff.org. The Henry J. Kaiser Family Foundation. November 30, 2010. Retrieved July 17, 2013. ^ "Health care law rights and protections; 10 benefits for you". HealthCare.gov. March 23, 2010. Archived from the original on June 19, 2013. Retrieved July 17, 2013. ^ a b Aaron, Henry; Frakt, Austin (2012). "Why Now Is Not the Time for Premium Support". The New England Journal of Medicine. 366 (10): 877–79. doi:10.1056/NEJMp1200448. PMID 22276779. ^ a b Moffit, Robert (August 7, 2012). "Premium Support: Medicare's Future and its Critics". heritage.org. The Heritage Foundation. Retrieved September 7, 2012. ^ a b Moon, Marilyn (September 1999). "Can Competition Improve Medicare? A Look at Premium Support" (PDF). urban.org. Urban Institute. Retrieved September 10, 2012. ^ "Debbie Wasserman Schultz says Ryan Medicare plan would allow insurers to use pre-existing conditions as barrier to coverage". PolitiFact. June 1, 2011. Retrieved September 10, 2012. ^ "Seniors Choice Act Summary" (PDF). February 2012. Archived from the original (PDF) on July 13, 2012. ^ a b "The Pros and Cons of Allowing the Federal Government to Negotiate Prescription Drug Prices" (PDF). law.umaryland.edu. ^ Dual Eligible: Medicaid's Role for Low-Income Beneficiaries", Kaiser Family Foundation, Fact Sheet #4091-07, December 2010, http://www.kff.org/medicaid/upload/4091-07.pdf. ^ Jiang HJ, Wier LM, Potter DEB, Burgess J. Hospitalizations for Potentially Preventable Conditions among Medicare-Medicaid Dual Eligibles, 2008. Statistical Brief #96. Rockville, MD: Agency for Healthcare Research and Quality, Healthcare Cost and Utilization Project, September 2010. ^ The National Commission on Fiscal Responsibility and Reform, "The Moment of Truth." December 2010. pdf. ^ Theda Skocpol and Vanessa Williams. The Tea Party and the Remaking of Republican Conservatism. Oxford University Press, 2012. ^ National Commission on Fiscal Responsibility and Reform, "The Moment of Truth," December 2010. ^ Office of Management and Buddget, "Living Within Our Means and Investing in the Future: The President's Plan for Economic Growth and Deficit Reduction." September 2011. ^ Sen. Tom Coburn and Sen. Richard Burr, "The Seniors' Choice Act," February 2012. ^ Beeuwkes Buntin M, Haviland AM, McDevitt R, and Sood N, "Healthcare Spending and Preventive Care in High-Deductible and Consumer-Directed Health Plans," American Journal of Managed Care, Vol. 17, No. 3, March 2011, pp. 222–30. ^ "Congressional Committees of Interest". Center for Medicare Services. Archived from the original on February 3, 2007. Retrieved February 15, 2007. This page was last edited on 12 April 2019, at 05:29 (UTC).